They want to be the fastest team ever to trek unsupported from the Canadian coastline to the North Pole. The expedition concept is to trek light and fast, i.e. with a substantially lower starting payload than normal. This will enable the team to endure longer days and to make faster progress than what has been achievable with a traditional and much heavier starting payload. This is the concept which gave success to the team’s record breaking 2008 South Pole expedition. The expedition plans on insertion from Resolute Bay in Canada to the starting point at Cape Discovery, Ellesmere Island, at around 20.03.2012. The planned starting date is 22.03. 2012, when it is new moon and the ice conditions are at its best. The geographical distance from the starting point to the North Pole is 775 km, but ice drift makes the expected trekking distance approx. 900 km. Since the ice is drifting towards the shores of Ellesmere Island, the first degree (110 km) will be demanding due to the pack ice. Recent expeditions have recommended a bearing 5 degrees west in the beginning. The next major challenge will be the ice conditions at approx. 87 degrees north, where huge ridges below the ocean surface creates currents and heavy pack ice. The expedition will be equipped with swimming suits which will allow crossing of open waters, in areas where it is not feasible to go around. They plan to be on skis 11-12 hours per day. This requires 8-9 hours of sleep, and hence efficient camp procedures (with 24 hours a day available). 11-12 hours per day on skis means a daily energy consumption of 8.000-10.000 kcal. The energy content of the food ration is approx. 5.500 kcal, which is about three times an everyday diet for most people. This means that the expedition members will have to gain 10-12 kilos prior to the expedition, in order to have sufficient body fat and energy reserves en route. The expedition plans on extraction from the North Pole via the Russian Barneo base at 89 degrees north to Longyearbyen at Spitsbergen. Communications en route will be by satellite telephone and a tracker which will automatically report time and position. Additionally the expedition will bring a rescue beacon. Educated as officer from the Norwegian Naval Academy, MBA and Authorized Financial Analyst (AFA) from the Norwegian School of Business and Economics. Current occupation : partner at asset management firm Industrifinans Forvaltning, with responsibility for Nordic real estate investments. Previous background from Deloitte Consulting and Braathens SAFE (airline). 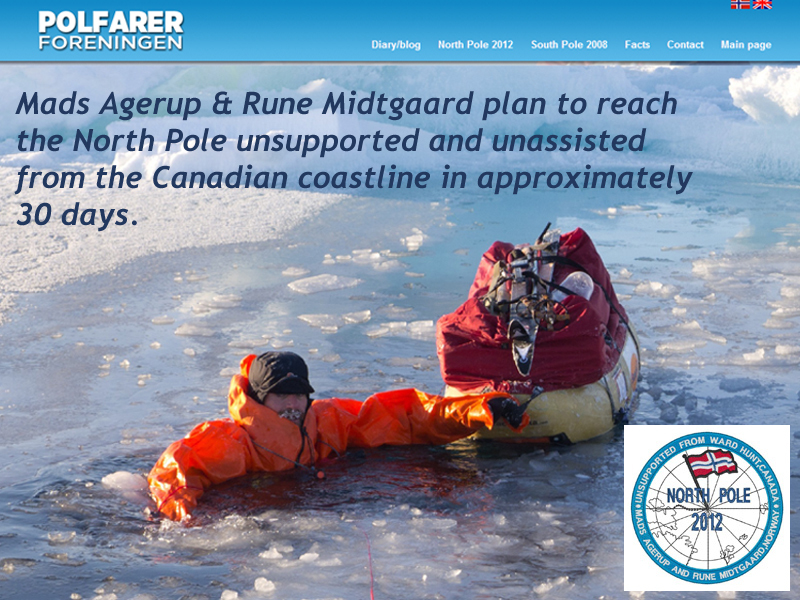 Previous expedition experience from Baffin Island, Greenland and the South Pole. Mads has always been an admirer of the Norwegian polar explorers, and he has determinantely been preparing for a North Pole expedition since 2008. Educated as operator and officer from the Norwegian Special Forces, MBA and Authorized Financial Analyst (AFA) from the Norwegian School of Business and Economics. Current occupation as CFO of Sunde Group. Previous background from FSK/HJK (Norwegian Special Forces), Deloitte Consulting and Industrifinans Forvaltning/ABN AMRO Capital. Previous expedition experience from Greenland, the South Pole and a number of high altitude climbs in Europe. Rune enjoys a diversified menu of physical training. Prior to a polar expedition the menu is typically dominated by tyre pulling and a heavy rucksack as well as cross country skiing in his neighbourhood forest. Alternative activities are weight lifting, judo and skydiving for mental recreation.